Forest Hills, a neighborhood in central ​Queens, comes in three parts. Its jewel in the crown is beautiful Forest Hills Gardens, built as a planned garden city community starting in 1909 and still the most exclusive address in Queens. Home for many is in apartments, co-ops, and condos along and on the north side of Queens Boulevard. West and south of Forest Hills Gardens are Central Queens-style single- and multi-family homes, developed in the 1920s through 1940s. The New York Times characterizes Forest Hills as giving its residents an urban vibe with a quieter suburban lifestyle and points to its quick and accessible transportation to Manhattan and abundance of good restaurants and shopping as its positive points. Plus it is more affordable than Manhattan or many parts of Brooklyn, says the Times. To the south, Union Turnpike and Forest Park border Kew Gardens. Middle Village and Rego Park are on the west at Woodhaven and Yellowstone boulevards. North of Queens Boulevard, it's Flushing Meadows Park to the east. Officially, 102nd Street and the Long Island Expressway are the borders with Rego Park. However, the Rego Parkistan feel is palpable from 67th Avenue. Austin Street is the big shopping drag, Metropolitan Avenue is more local, and wide Queens Boulevard is car-busy. Built as a planned garden city, the Gardens is a unique and private community. The Forest Hills Gardens Corporation owns the streets and ensures the buildings are authentic to the original designs. Though maintaining a 100-year-old house can be tough, for many, it's worth it. The neighborhood is simply beautiful, full of winding streets with Tudor and colonial houses, apartments and green spaces. It's exclusive but also a diverse and family-centered enclave. Forest Hills was farmland until the early 1900s when the new Queensboro Bridge spurred developer Cord Meyer to buy local farms. Meyer coined the neighborhood's name. 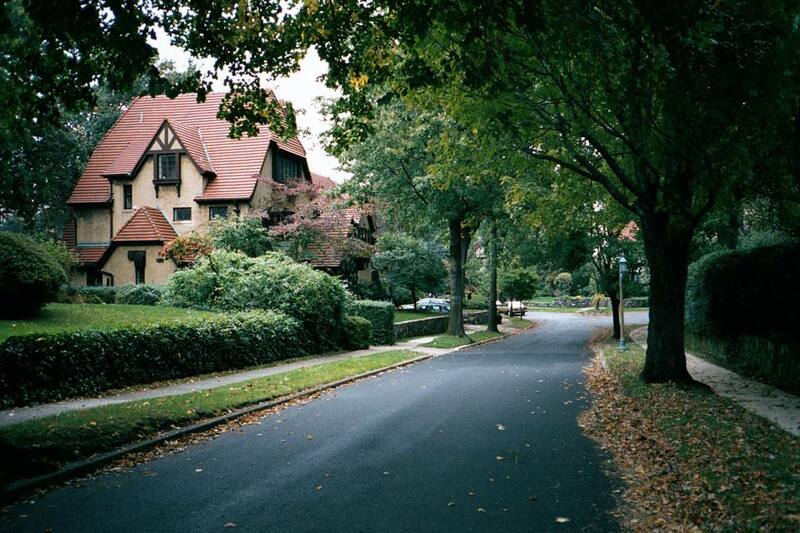 In 1909 Margaret Olivia Slocum Sage and the Russell Sage Foundation began the development of Forest Hills Gardens. Expansion of the subway led to more development in the 1920s through 1950s. Forest Hills was the site of the U.S. Open Tennis Championships from 1915 until 1977, held at the West Side Tennis Club. Austin Street owns the fancy eats and lots of good everyday choices, but Queens Boulevard is the better value for restaurants in Forest Hills. Try Nick's for thin-crust pizzas. Dirty Pierre's serves good burgers in a cozy pub in Station Square. Bann Thai won praise in the NYC Michelin Guide. Eddie's Sweet Shop is expensive but worth the walk to Metropolitan Avenue for creamy, homemade ice cream. From Queens Boulevard it's not a bad walk south to Forest Park, a real gem with walking, biking and horse trails, plus all sorts of athletic fields and a golf course. Flushing Meadows Park is close but a difficult walk, competing with highway ramps. MacDonald Park is for sitting and watching traffic. The Ehrenreich-Austin Playground was renovated in 2005. Other smaller open spots dot the area, especially in the Gardens. Austin Street, the main shopping drag, likes to think it is hoity-toity, and it does have plenty of boutiques and small shops. Chain stores also pepper the strip from Ascan Avenue to 69th Place. Always busy, Austin Street is thronged on weekend afternoons. Metropolitan Avenue is known for antique shops. Shops on Queens Boulevard are varied. Forest Hills is one of the safest neighborhoods in Queens. As always, keep your wits about you, especially at night. It's a bad idea to walk alone in Forest Park at night or in its more isolated areas.